It's Day 7! You know what that means? Hercules is complete and we're going to check him out! TF Club Toys gave us something Hasbro has yet to even attempt... a real, honest to gods, modern update of one of Transformers most famous and beloved combiners; Devastator. Over the past week I've given you glimpses into each and every piece that makes up this behemoth, and I have to say, I am still majorly impressed with this figure set. Today, it's our last look at this excellent figure set. He's fully combined... all 6 of the Hercules team are here, Exgraver, Dr. Crank, Neckbreaker, Heavy Labor, Mad Blender, and Structor... and he's merged for the kill. ... throw 'em into your pile of loot while you can! This guy is a behemoth. He is one of the largest Transformers that I have seen produced in quite some time. Each of the Hercules team could easily be considered a Voyager scale figure. All of them have equaled Classics scale Prime in height... which makes a fully combined Hercules measure a good 13 inches tall. He stands just shy of Energon Omega Supreme's 15 inch height. ... and the back ends of Structor and Mad Blender have the connecting ports to attache to Heavy Labor that act as Hercules' knees; with Heavy Labor's own waist acting as Hercules'. There is plenty of articulation allowing for Hercules to assume a wide range of poses. The only downside that I really found; his mass does throw him off balance and some support may be needed. On top of just his normal articulation, they did a good job on his hands. He's no Master Grade Gundam articulation, but he's pretty good. All his fingers are hinged twice, with his thumb on a ball-joint and then hinged mid-way. Now, as afar as I can remember, Devastator never shot anything. He was always depicted as an engine of brute force pummeling his way through whatever he needed too. 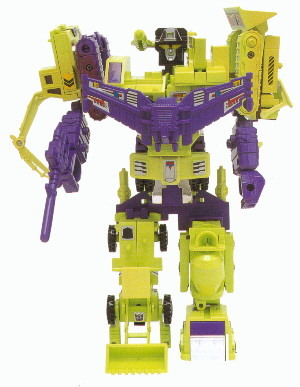 Nonetheless, G1 devastator came with a gun. So, Hercules wouldn't be complete without firepower to match. The genius here, all the Hercules' teams guns combine to form one giant hand-cannon for Hercules. All of the figures came with 2 guns, one purple and one red. The red guns are exactly the same, but as for why red, I've no idea. Hercules' articulated hands can hold the gun very well. It also helps that the gun that forms the handle (from Mad Blender) has posts on it so it actually connects into Hercules' hand. Once again, I can't express how in awe of this figure I am. TFClub really knocked it out of the park on this. People are constantly posting on their Facebook wall questions and requests regarding making other Combiner teams; Defensor and Stunticons most recently. Menasor and the Stunticons just happen to be my favorite Combiner team, if they made Stunticons like this, my wallet would be screwed. After seeing what Hasbro has in store for us with FoC Bruticus, their first real Combiner team in years, and then comparing it to this, I'm really not feeling the Hasbro product. People have been expressing their feelings on Hasbro's lack of really trying for years now. I know they can't please everyone, but sometimes, I'd just wish they'd at least try something like this. Heck, buy the molds from TFClub and keep producing it! But I'm sure that's not practical either. Overall, this has been an amazingly fun review to do. My thanks go to my buddy Kevin for allowing me to open these and quite literally play with them. Hopefully, in the near future, I can get my own set. With that said... that's it... the end. Thanks for tuning into my review of TFClub's Hercules. I now leave you with a myriad of pictures. Thanks for reading!